A gift set of 3 kids handkerchiefs with bright colourful edges and the letters of the alphabet along side cute phonic pictures. 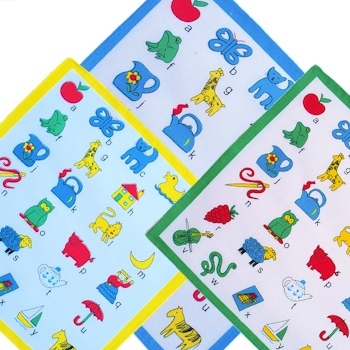 A gift set of 3 kids handkerchiefs with bright colourful edges and the letters of the alphabet along side cute phonic pictures. Little kids will love their very own set of hankies. A special small childs size hanky to fit perfectly into their pocket so its at hand to help runny little noses and catch those sneezes. Only yellow and blue trim alphabet hankies available.